Genomics, Medicine, and Pseudoscience: Putin muzzling science in Russia: a return to the Soviet era? Putin muzzling science in Russia: a return to the Soviet era? 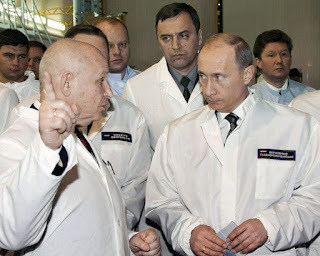 Vladimir Putin looking skeptically at a scientist. In a surprising development this past week, Russia has notified all scientists at Moscow State University (MSU) that they must submit their research papers to the state security service before they will be permitted to publish them. Nature News reports that Russia is imposing this policy on universities and research institutes throughout the country. Perhaps this should not be a surprise. Vladimir Putin has steadily imposed ever greater restrictions on the media, to the point where most Russians are not even aware that Russian-backed fighters shot down Malaysia Airlines Flight MH17 last year. This new move towards censorship is just one more step towards imposing Stalin-esque restrictions on all Russians. Requiring scientists to submit their manuscripts to the security services will severely cripple their ability to publish anything even remotely novel or interesting. Why take the chance? Exactly: Putin is returning Russian to the bad old days of the repressive USSR, when the state controlled all media and ordinary citizens were afraid to speak. For now, a few scientists were willing to speak to Nature, but we shouldn't be surprised if even those voices are silenced in the future. In a bit of absurdist theater, under the new policy Russian scientists who write their papers in English (as is commonly required for publication) must translate them into Russian, because the security service personnel (apparently) cannot read English. I doubt too that the Russian security services have the expertise to understand even a fraction of the papers that they are demanding to see. Russia has a long history of scientific innovation across all fields of science, particularly mathematics and physics. Under the repressive Soviet regimes of Lenin, Stalin, and their successors, many Russian scientists fled to the West, where they could work without fear of being thrown into a gulag. The U.S. and Europe–and the world–benefitted greatly from their expertise. Russia’s scientific output has been lagging in recent years, according to an article in Nature earlier this year. There have been a few bright spots, though, such as (in my own field) the recently-created Dobzhansky Center for Genome Bioinformatics at St. Petersburg State University, which has already published some outstanding papers. Now I wonder how long that new center will last. Ironically, the famous geneticist Dobzhansky, after whom the new St. Petersburg institute is named, left Russia as a young man in 1927 and moved to the U.S., where he went on to do his groundbreaking work in evolutionary biology. Putin’s obsession with power and control might be an opportunity for the rest of us. Here’s a call to Russian scientists: follow Dobzhansky’s example and come to the U.S. We may have our flaws, but you can publish your work freely, and you can even write a blog criticizing the leaders of your university, or your former university's football policy, or your political leaders. And the GOP wants to muzzle work on climate change, etc.